I love pumpkin bread, and pumpkin cupcakes are even better …but for a brown, spicy, fall-flavored something like pumpkin bread, you need frosting to match. This simple penuche frosting comes from a recipe for applesauce cake, and makes a stiff, fondant-looking frosting somewhere between a brown-sugar glaze and maple syrup candy. This recipe (based on this one) is like real bread: time-consuming in spurts, with a lot of periods where you just ignore it and go do something else. Beforehand: Clear a shelf in the fridge to accommodate a cookie tray full of cooling cupcakes. Prep cupcake pan. Gather a wooden spoon; a medium sized, heavy saucepan; and an empty cookie sheet. If you want to serve these with hot apple cider and some ice cream, get that together too. scant 1/8 c milk (I used light soymilk and added a pinch of powdered xanthan at the end before the cooling stage to help make sure things bound properly. Despite the name and its prevalence in long lists of suspicious-looking filler ingredients, xanthan gum is a natural ingredient and a pretty cool substitute for gelatin to help firm things up). Butter (or add cupcake papers to) a 12-cupcake pan. In a small bowl, whisk together flour, salt, baking powder, spices. In a larger bowl, beat together butter, sugars, and oil on high speed until fluffy, scraping sides often. Add pumpkin and mix until blended. Add eggs or equivalent, one at a time, and mix until just incorporated. Mixing slowly, add flour mix and water until just incorporated. Spread batter into prepared pan and bake until a toothpick inserted into center comes out clean, ~50min. Remove from pan (if using cupcake papers) or let sit in pan 20min, and allow to cool completely so that frosting won’t detach itself. Start making penuche frosting when the cupcakes are mostly cooled. Combine all frosting ingredients in heavy saucepan over medium-low to medium heat stirring with a wooden spoon until boiling (boiling sugar is HOT, so be careful!). Reduce heat to a simmer and let it cook undisturbed for about 5min, or until it registers 234F on a candy thermometer (I don’t have one). Have cupcakes ready, removed from their pan and assembled next to the cookie sheet. Remove frosting from heat, add xanthan (if using), and stir vigorously (don’t splash) until well combined again, then keep stirring gently until mixture starts to look a little paler and lose its gloss. This mixing / cooling process may take 5-10 minutes of pretty lazy stirring. What to look for: A blop of the mix, removed with a spoon and drizzled back into the rest of it, should retain some type of shape for several seconds, demonstrating some reluctance to melt back in right away. 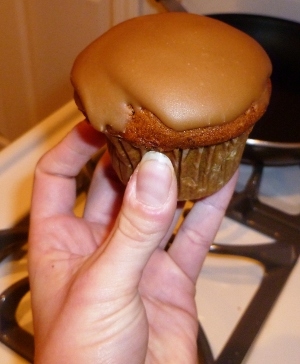 What we want is frosting that will cool enough on the cupcake that it will harden up before dripping off the edges. The penuche will still have a bit of translucency, but it will look a bit closer to homemade caramel than to maple syrup. Immediately begin to dip tops of cupcakes in still-wet frosting mix: invert cupcake, dip, twist, and then wipe off the edges against the side of the penuche pan. Assemble frosted cupcakes on the cookie sheet as they are frosted. One or two drips are OK, but if the 1st one is dripping before the time you get to the 3rd or 4th one, you need to wait a few more minutes. Put cookie sheet full of cupcakes into refrigerator to cool. Penuche should lose remaining translucency to look like in picture. Serve cold, with hot apple cider and a bit of light vanilla ice cream.